The tag line for Fuduntu reads “Fuduntu – Punny Name, Serious Distro”. My initial thought was that it would be another Ubuntu clone but after reading the about page on the Fuduntu website (http://www.fuduntu.org/) I found out that Fuduntu is primarily based on Fedora but has the look and feel of Ubuntu. (Well Ubuntu before Unity). I downloaded the ISO from the Fuduntu download page (http://www.fuduntu.org/get.php), used Unetbootin to burn it to a USB drive and proceeded to install Fuduntu to the hard drive on my Samsung R20 laptop. Fuduntu has its own installer but it is fairly similar to the one used by Ubuntu. It is fairly easy to work out what you need to do to install the system. Choose whether you want to use the whole disk for Fuduntu, then select where you live and the username and password you want to use to log in. All fairly standard stuff for modern distributions really. 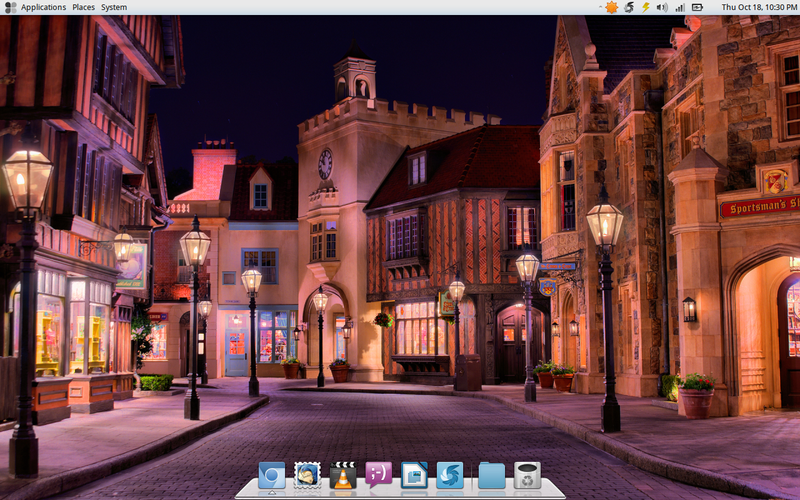 Fuduntu is a throwback to the pre-Gnome 3 and Unity desktops. Fuduntu comes with the Gnome 2 desktop with a taskbar at the top and a dock at the bottom. The most notable part of the desktop is the majestic image of a tiger. It is hard to believe that you won’t like the picture of the tiger but if you don’t it is easy to change it by right clicking on the desktop and clicking “change desktop background”. There are 18 backgrounds available by default and most of them have bright vibrant colours. 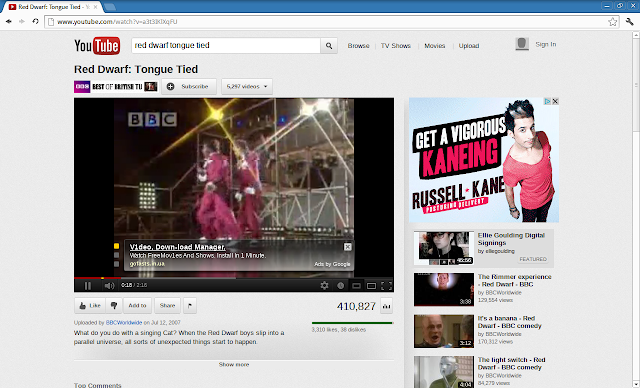 The taskbar at the top of the screen is fairly standard. Firstly there are three menus “Applications”,”Places” and “System”. When I look at these menus and look at how Unity and Gnome 3 have changed the desktop landscape I wonder whether we have really progressed. I find it hard to believe that any system is easier than finding your applications under the applications menu, your files and folders under places and anything system related such as setting up users and installing applications under system. The main thing missing of course is the ability to search for an application. On the right hand side of the toolbar are icons for showing notifications, a lightning bolt which provides information on cpu usage, temperature and screen settings, a volume control, a wireless icon, a battery monitor and the clock. The dock at the bottom of the screen has icons for the most commonly used applications including Chromium (Web Browsing), Thunderbird (Email), VLC (Media Player), Pidgin (Messenging), LibreOffice Writer (Word Processing), File Browser (File Manager) and Garbage (Rubbish Bin). Connecting to the internet was very easy. I clicked the wireless icon on the toolbar and both my home broadband connection and three mobile broadband connections were available. I entered the key for the three mobile broadband and I was connected in seconds. The default browser installed on Fuduntu is Chromium which for me is a good choice because I prefer Chromium over Firefox. The next big test was whether I could play flash videos and listen to music. The first test was to go to You Tube and attempt to watch a video. The video I chose was the song in Cat’s dream in Red Dwarf and as you can see from the image above it worked straight away without having to install any extra software. Normally to test playing MP3s I use either Rhythmbox or Banshee but neither is installed within Fuduntu so instead I used the VLC player to play an MP3 file and it played without any issues which again means there was no messing around trying to install the correct codecs. I think that Fuduntu has a very good balance of applications installed by default. Rather than go for a scattergun approach and install two of everything the Fuduntu team have basically made a decision for each type of application meaning that the system is completely useable straight away but not overly bloated with software that needs to be removed. Under accessories there is an archive manager, calculator, the gEdit text editor and Shutter which is a very good screen capturing utility. Under graphics there is GIMP (Image manipulation), Shotwell photo manager and LibreOffice Draw. Under the internet section there is Chromium (web browser), Pidgin (Instant Messenger), Remmina (remote desktop client), Thunderbird (Email client) and Dropbox (Online file storage). Under Office Tools there is LibreOffice Writer (Word processing), Calc (Spreadsheet) and Draw (Drawing). Under System there is GParted (Partition manager), a cd/dvd creator, backup tool, system monitor and terminal. I think that if you are going to install LibreOffice Writer and Calc then you may as well install Impress as well and also it would be good to have either Rhythmbox or Banshee. If you need an application that isn’t already installed then you can install applications by choosing add/remove software under the system -> administration menu. 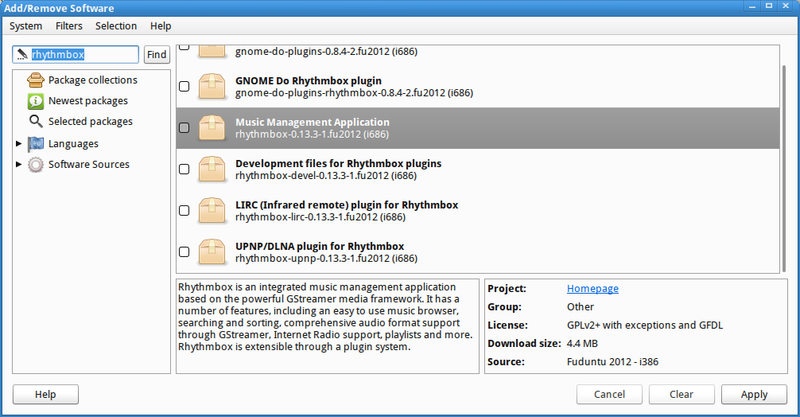 Fuduntu uses its own repositories. As Fuduntu is a Fedora based distribution RPMs are used. The easiest way to find a package is to type the name in the search box and click find. If you don’t know the name you can also enter the type of application (for example music player). 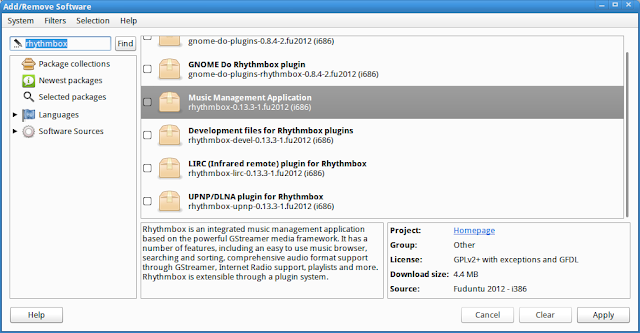 A list of applications that can be installed appear in the right hand pane. To install the application check the box and click apply. It is possible to use the Fedora repositories but because of Fuduntu’s reliance on Gnome 2 it is better to attempt to use the Fuduntu repositories first as the applications have been tested and are more likely to work with Fuduntu. Fuduntu is actually very nice. I had forgotten just how good Gnome 2 is and it makes my laptop run like a dream compared with Unity and Gnome 3. The menu structure is so easy to follow and the dock at the bottom makes it easy to launch applications. I think the Fuduntu team have got the balance right when it comes to choosing which applications are installed by default although as mentioned above a music player like Rhythmbox would add a bit more value to it. The look and feel is very clean and the choice of background images make the whole experience very pleasant. There are a few neat window effects included as well courtesy of Compiz. I have been using this distribution for a few days now and I haven’t hit any errors or issues. Usually there is something that hits you straight away but with Fuduntu there are no obvious problems which means it is stable. So how does it relate to other operating systems? I really like Zorin (http://www.everydaylinuxuser.com/2012/07/zorin-6-best-operating-system-i-have.html?showComment=1350594295140#c1906898506465356337) and because Zorin has its own desktop I would put Zorin a little bit ahead. With regards to Ubuntu I would say that Fuduntu is aimed at a different audience. Fuduntu definitely works better on older hardware and it is lighter on resources. Against Mint I would say I prefer Fuduntu’s Gnome 2 interface over the Mate desktop (http://www.everydaylinuxuser.com/2012/08/linux-mint-13-everybodys-best-mate.html) but that is because it is more mature as a desktop. 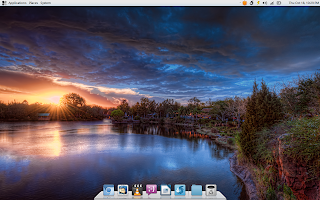 Mint 13 with the Cinnamon desktop is a far better experience but again you need to have the system resources to cope with running Cinnamon. Fedora is now heavily Gnome 3 based and as with Ubuntu I think it is aimed at a different audience. 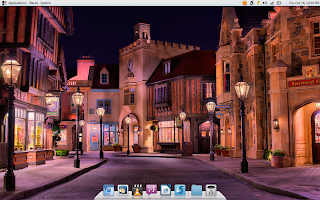 I do not know how long the Fuduntu team intends to continue using the Gnome 2 desktop and whether they will adopt one of the other desktops as they mature or whether they will do the same as Zorin and create their own desktop. For now though none of that is important. If you like Gnome 2 and you like Fedora how it used to be but with all the hassle of installing extra codecs and software taken care of then Fuduntu is well worth installing. Thanks for the very in depth review. I have Zorin OS Lite installed on an old Vista Laptop which has breathed life into the old dear. Although I have not tried fuduntu yet I have tried xubuntu on a Windows 7 laptop. After 2 months of use I very rarely boot into Windows now maybe 1 per week. 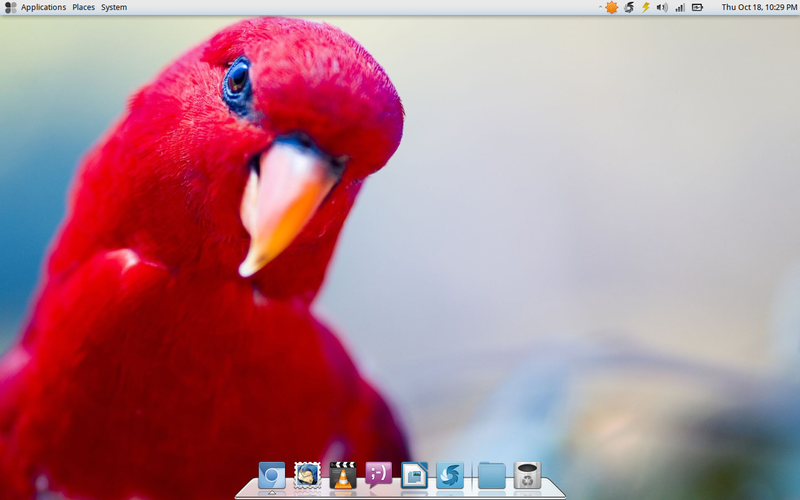 You may wish to take a look at Xubuntu too. I've used Fuduntu on and off for a few years now and think it is great for when I just need a quick Linux system up and running. At work when my Windows machine starts buffering too much, I take out an old Dell laptop with Fuduntu to get on to the internet to get the work done. Can I ask for the third wallpaper please? The street one, looks brilliant. its the best distro. its rolling release. It looks like its based on scientific linus/cent os, so gnome 2 is gonna stay for 4-5 years. Also the guys behind it seems to be very efficient and smart. The only question is why people are not much using it. I mean probably it needs some sort of marketing or something ?.Seriously for me its much better than linux mint. I want this distro to stay alive, unlike other small groups that fall due to economic crisis. hardly better than linux mint but it is a good distro. 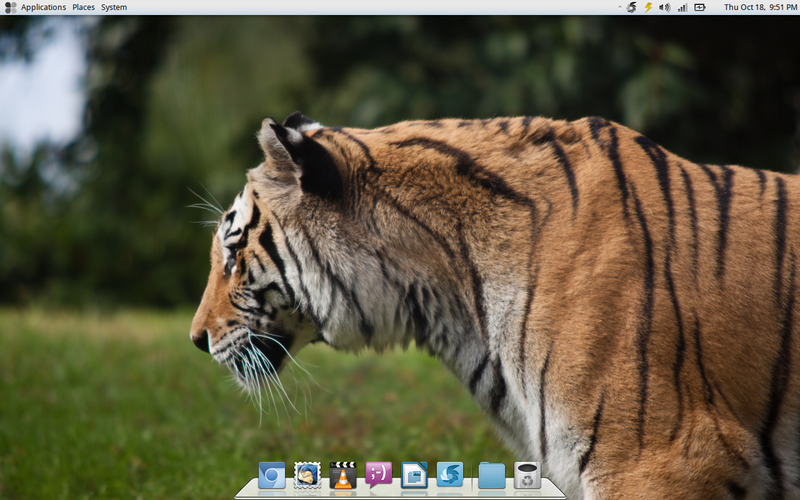 Linux mint with cinnamon has a more modern design with out the dock at the bottom. This appeals to more users out there. I just installed Fuduntu on my Lenovo Edge 125 netbook. It's the only Linux distro that I've been able to run on it that works well (snappy) and has excellent battery life. I like Fuduntu but I didn't realize that you could add the Fedora repos to it…how do you do this? It's not an option when you go into settings/software sources etc. Actually just because you can add the Fedora repositories doesn't mean you should. "Since Fuduntu is now a fully forked distribution, we maintain our own repositories. All the repositories we support are available when you install Fuduntu, but only Fuduntu Stable is enabled by default. In the past we supported users going to repositories such as RPMFusion, Fedora, etc as an additional source of packages. Now that our fork has fully matured, we find that too many of the packages from outside sources are no longer compatible with Fuduntu, so we no longer recommend them or support them. Some users may elect to activate additional repositories on their own, but the risk is greater now that the packages from these repositories will not install, or might install and break your system"
Fuduntu is a great distro, but it will be nice if redhat made it a little more user friendly. thanks for good review. after reading I've switched to fuduntu and I'm really happy. for me and my mainly soho usage it's great. with all needed progamms (except radiotray but it can be installed separately). by the way who knows how to change number of workspaces?? I like three, not four. going back to fedora. installing cinnamon desktop and decreasing the swappiness parameter it is my second favorite. I've only been using it for a few days but so far Fuduntu has proven to be the most compatible distro for my Acer One 522 Netbook. Most other distros suffered from crash after logging (albeit that started after an update so it may have been solved now), I was previously running a modified JoliOS although that was basically Ubuntu 10.04 but the fact that plugging headphones in didn't mute the speaker made life annoying. Performance under Fuduntu is better than with the Win 7 OS that the netbook came with and also better than it was with Mint 12. Absolutely best distro around, install and forget. Great idea and philosophy to join stability with rolling update which the biggest problem for any linux distro and also the main reason I usually had to change installation and tried most of distros during last 10 years. I just installed Fuduntu on my p.c. but I cannot connect with internet. The look reminds me of the apple OS eg OSX. I've never ventured away from MS Windows for my laptop but I'm becoming tempted to try Ubuntu in one form or another. The only problem I can imagine is finding the right drivers to make Ubuntu work with my particular laptop.